Facebook: Going to the Dogs? A few weeks ago, I grudgingly acknowledged that we might be in the decade of Facebook. Since then there has been backlash of various forms, defense of Zuck and his firm against said backlash. None of it has changed my mind about FB. A couple of snappy canine remarks caught my attention recently: hence this post. First is dabitch’s observation. Facebook – you are not the customer. You are the product. The point, of course, is that what you might think of as your data is FB’s product. 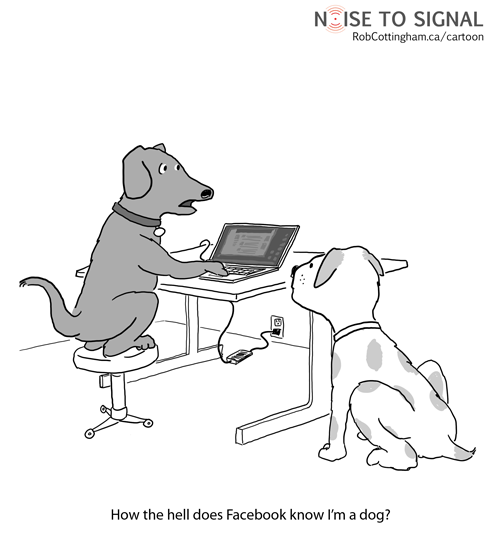 Second is Rob Cottingham’s brilliant update to the classic On the Internet, nobody knows you’re a dog. While I’m not barking mad at FB, but I do appreciate a well-phrased growl at it. Author andrewPosted on May 16, 2010 Categories Business, Uncategorized, WebTags dog, facebookLeave a comment on Facebook: Going to the Dogs?